Overlooking the coast of Corsica. There are many benefits of having been an adventure travel guide for more than 25 years. One benefit high on my list is the option to live part of each year in Europe and part on the Island of Maui, Hawaii. 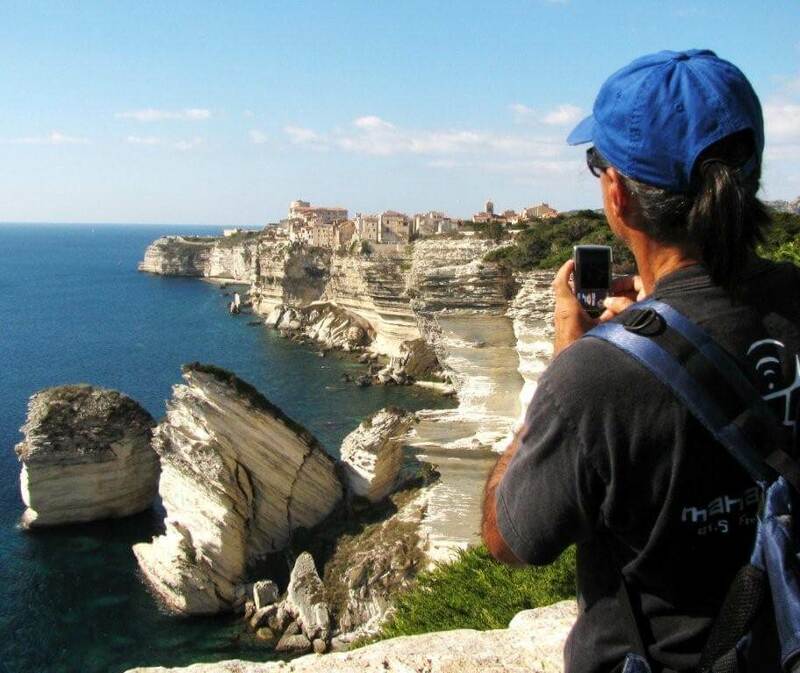 Another is leading walking tours in Corsica for Walking The World. As a world traveler, and professional chef, people regularly ask me to share my top European travel destination. While there are many, beautiful and culturally inviting destinations, Corsica is always at the top of my list. Corsica, an island in the Mediterranean, is often described as The Mountain in the Sea or the Island of Beauty. Rightly so. There is great hiking, plentiful sunshine, and a culture heavy on tradition. I wholeheartedly recommend you take a moment to schedule a visit to this island paradise. Or, join us in October, 2017, on one of our walking tours in Corsica. Corsica is one of 18 regions of France and sits about 50 miles west of Tuscany. It’s on the same latitude as Rome, and is just about nine miles north of the Island of Sardinia. The natural beauty of Corsica is breathtaking and inspiring. Often, when walking with friends, we experience moments when all we can do is look at each other and smile. Sometimes there are simply no words to adequately describe the beauty we encounter. And beyond the graceful beauty of the land and sea, the culture and gourmet delights are incomparable. Corsica is truly a unique destination for a walking holiday. Becuase it’s part of France, culturally it claims its own special ambiance. On the other hand, for years Corsica was part of Genoa, Italy, and therefore there is a strong Italian influence wherever you go. This popular Mediterranear Island’s diversity is raw, stunningly beautiful, and inspiring. 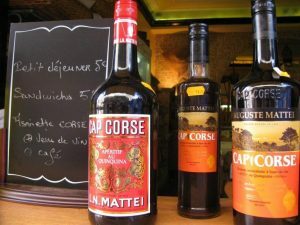 The Corsican people are proud and strong. They hold their island and its culture close to their hears and maintain complete control over any development. My very close Corsican friend Antoine, and his family, call the small village of Cargese their home. This small town, founded in the 17th century by Greek refugees, offers some of the best of Corsica. 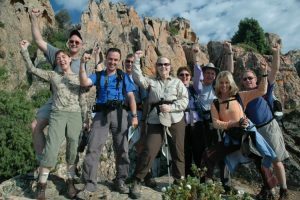 And, of course, if you join us on one of our Corsica walking tours, you’ll meet my friends and experience their hospitality. Personally, I’ve been visiting the village of Cargese for the past 25 years. I know the village stories. There’s the Butcher, and of course, you’ll love the Anne, a character now in her 80’s, And there’s the baker who offers hot croissants fresh from the oven at 3 am to the 20 somethings still up after an enjoyable evening out. While there is no candlestick maker, there is the handsome village doctor who is a record holding free diver. And let’s not forget my friend, the charming boat captain Renaldo. This rugged, seafaring sailor will take us aboard his vessel and along the coast, providing a unique perspective of Corsica. Corsica’s scenery and wildlife are diverse and spectacular. There are dramatic, high, pink, granite mountains, dotted with aqua alpine lakes. 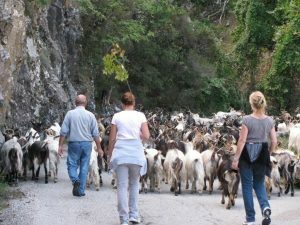 We’ll meet many charming but mischievous goat herdsand these friendly four-legged residents provide the most outstanding goat cheese this chef has ever tasted! And, if you visit Corsica, you must experience the spectacular coastal region of the Scandola Nature Reserve. This reserve, with its impressive and unique red rock formations jetting into the azure blue sea, has been protected as a “World Heritage” site since 1975. Scandola is an exceptional sight even among the other many natural wonders in Corsica. Strange rock formations emerge from the crystal clear sea in the Gulf of Girolata. The coastline here is peppered with jagged inlets and caves. The Scandola reserve is also home to a wide range of sea birds, including cormorants, giant gulls, and Osprey, that benefit from the protected environment. There are also established seal and dolphin colonies. 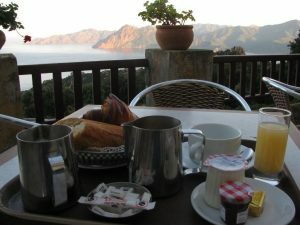 In conclusion, Corsica is a beautiful experience and a photographer’s dream! I hope you’ll join me for a walking vacation in 2017 you’ll long remember!